Sometimes there are patterns that catch on in the blog circles that I don't bother with because they seem more like trends than good ideas. I'm the opposite of a trend follower as I actively avoid doing what everyone else is doing, at least till I see some value in it personally. 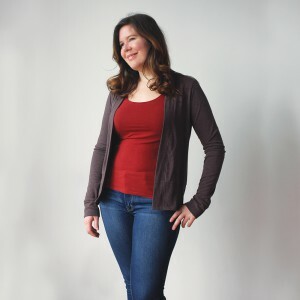 Enter the Blackwood Cardigan by Helen's Closet. I had seen it around on blogs and IG, so I took some time to stalk it a bit. It seemed to me that it made pretty much everyone who wore it look good, so I decided to finally join in on the Blackwood train. For my fabric, I found a DBP that I fell in love with from Boho Fabrics (search Monique. It's low stock as of now, prob sold out soon). Florals aren't my go to fabric, although the occasional floral on the perfect garment has been known to fall in my wardrobe. This one was great because it was a larger print and it was on a navy background. I found I don't have a whole lot of shirts to wear under it as I usually wear black or blacked based cardigans. Which is just the excuse I need to make more shirts. I cut the XL size with no other alterations and went to town. It is a fantastically satisfying sew (read: easy but still looks good). I only screwed it up a couple times (my fault, not the pattern). Somehow I marked the notches wrong and ended up with a weird, and I mean weird, stretching of the neckband. After scratching my head for awhile, I finally figured out where I was supposed to have put the notches, resewed it and all was well. The other thing is I may or may not have cut the wrong band out for this length. The pattern piece that was sitting on the table next to the piece was the wrong one, but then it went in to the cardigan perfectly, so maybe it wasn't? Who knows, either way it turned out. This is one of the few makes I've had recently that makes me feel great about sewing. I love it, love it! I made this months ago and am only now posting about it due to DBS (delayed blogging syndrome), and have worn it so many times. Not recently, of course, as the weather here is absolutely sweltering. So, I'm holding out making more till this fall, but believe me, there will be more. I bought all the products in this post because I love them and am giving my honest opinion of them. Some links are affiliate links and may result in financial benefit for me. Most likely I'll use it for more fabric for blog posts, so click away! Posted in Sewing. 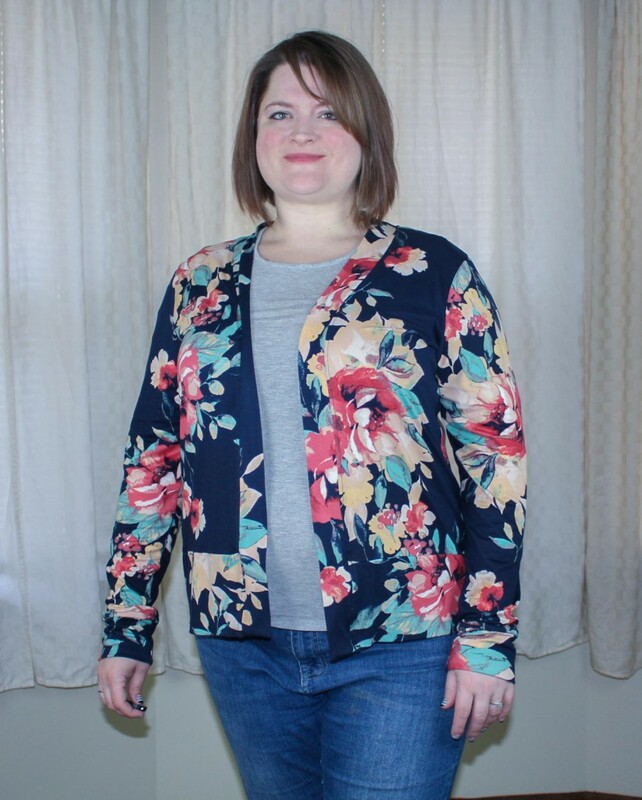 Tags: blackwood cardigan, cardigan, completed garment, completed project, diy fashion, diy wardrobe, helen's closet, sewing, tnt, tnt cardigan, tnt sweater on July 18, 2018 by ladyreed. Work has exploded in the last couple weeks, so I haven't been able to get into the sewing room, as sad as that makes me. So, to keep this blog from turning into a completely barren wasteland, I'm going to update about a dress I made back in December but haven't blogged. The Pattern 4 Pirate's Wiggle dress is a figure hugging dress that is for those who aren't afraid to flaunt it! 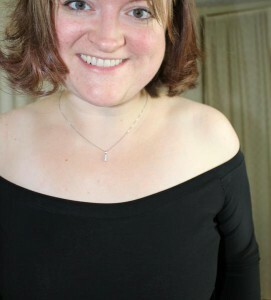 Normally, this style wouldn't be in my comfort zone, but made up in a black fabric, it's close enough to a LBD that I can feel moderately comfortable in it. I wore it to a date night to see a musical (Waitress - loved it!!) and I still felt like the most dressed up person there. It didn't help that it was pretty cold that day, so must people were choosing warmth over glam. Not me! Ha! The instructions are pretty straight forward, but of course I managed to complicate it a bit. I didn't do any pre-cutting alterations, other than to give myself very large seam allowances around the bust. Then, I just tried it on and pinned it and sewed (and repeated like 5 times). I took a large chunk out of the back, kind of like a sway back adjustment, as well as some off the sides. Around the top of it, I took several inches (maybe 4?) out of the upper bust. The only thing I really deviated on is the finished for the top. Instead of doing encased elastic, I finished it with a band. For some reason the thought of it just turned didn't seem as nice to me. Probably just me, but I wanted it, so I did it. To make the band, I measured the top once all the adjustments were done. Then, I multiplied that by .85 and used that length to make a band from. From there it was just like finishing any banded edge. I cut it originally at calf length thinking I was going to add a circle hem, like a mermaid skirt. However, after trying it on, it was overwhelmingly black. I decided some leg was the way to go and chopped it off just above the knee. With high heels, this was perfect for a night out! I have a couple other Wiggle Dress shirts (sounds funny to say it that way!) planned. However, if I don't get to them soon, it will be out of season and I don't know if I'll end up making them or not. If I do make it again, I'd like to more of the adjustments up front instead of pinning and sewing after cutting can be frustrating. In addition, I'm going to add more of a peplum/flare shape to the hem of the shirt. Posted in Sewing. Tags: completed garment, completed project, diy wardrobe, dress, me-made, patterns 4 pirates, sewing on February 19, 2018 by ladyreed. For the next window, I'm going to keep the Sunny Dress hack. I've got it all cut out, just need to assemble. Easier said than done as it's got bias tape lattice design elements. I'm also keeping the goal to complete the Seamwork York WIP. It shouldn't take too long, so I want to get it done. I'm going to remove the Shelley leggings from this window's goals. I bought the new Avery leggings pattern from Helen's Closet and will be sewing those up soon, although not this window. 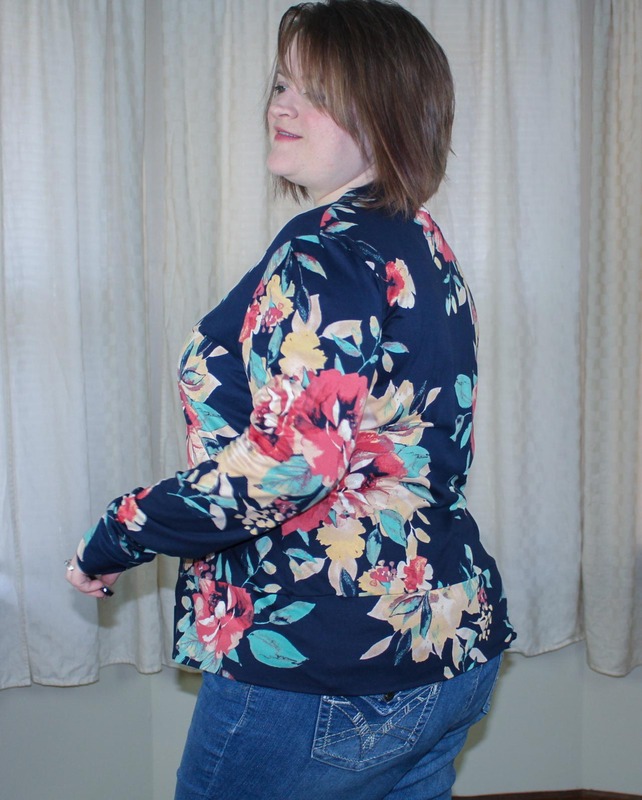 I also bought the Blackwood Cardigan from Helen's Closet and beautiful navy floral DBP, so I'm adding that to the list. That will probably fill my time, but if I do have extra time, I'll fill it with practicing pattern drafting. Nothing too specific, just practicing drafting for me and draping for the half mannequin. Posted in Planning. Tags: 3D capsule, 3D capsule wardrobe, diy wardrobe, intentional sewing planning, sewing, sewing planning on February 5, 2018 by ladyreed. My first plan of what two sew over the course of two weeks has gone well, somewhat to my surprise. Historically, I've not been great at making a plan and executing it, as I get distracted along the way. By breaking it up into only a two week plan, it's a lot easier to stay focused as I can tell myself that I'll get to decide on my next project very soon. 1. Made a muslin version of the Sunny dress. Good thing, too! It was very badly fitting, so I ended up doing some surgery on it to get it to fit. I made an IG story of the process, which you can check out on my story highlights here (http://instagram.com/ladyreed84). 2. Design Sunny Dress hack. Done! Although I confess that I didn't finish this till Wednesday, but I'm counting it close enough. 3. Design a 3D capsule wardrobe. I spend over an hour on this one, so I'm calling it complete. However, I realized after that hour that I had no idea what it meant to design it. Was I wanting to pick patterns? Was I working through shapes, silhouettes, etc.? I finally ended with a pile of sketches of things I want to make and I picked a few patterns that I'd probably start with to make those. I'm not limiting myself to these, as I want to make what I want, assuming it fits in one of the style categories. So, in the end, I'm calling it complete, but I'm not really sure how or what I accomplished. Effort for the win! 4. Pick 3D capsule wardrobe color palette. Done! I did this and I'm in love with it! I have lots of fabric in the blue, black, white, gray. However, my accent colors I have less of. Now I can do focused shopping and feel less wasteful about me purchases. Win, win! 5. Made two pairs of PJs for my hubby. He wears them all the time now, which is the best possible compliment! For the next two week, (which has already started and I'm just now getting to this) I'm going to have to go light on what I want to sew. Work is insane until the 24th, so I won't have a lot of time for bliss projects. I'll pick two things to work on and a couple things for if I have time. 1. Sew the Sunny Hack. It's designed and the pattern is ready, just cut and sew now! 2. Cut out the Seamwork Shelly leggings. I really like the gusset (panel?) for shaping and am hoping to get a great fit! I'm going to make these out of light gray poly jersey. Posted in Planning. 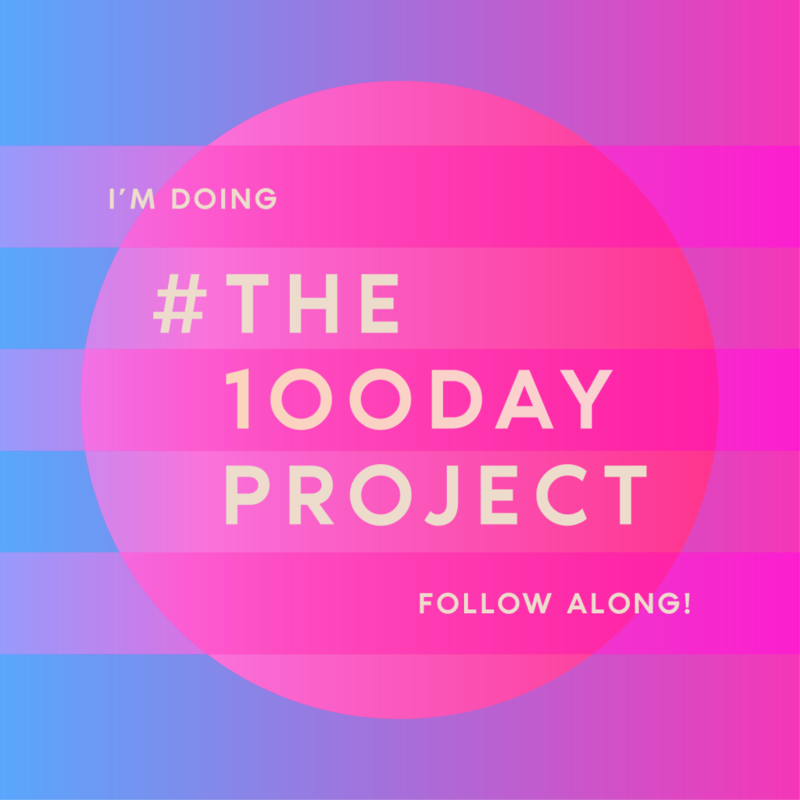 Tags: diy wardrobe, intentional wardrobe, planning, project update, sewing, sewing planning, wardrobe planning on January 22, 2018 by ladyreed. For my first 3D capsule wardrobe (I've started thinking about it as a cube), I'm going with a cool winter color scheme that has touches of spring colors. I'm hoping to transition into spring nicely. The main colors are ones that I have quite a bit of in my stash, but the accent ones not as much. I hope to do very little buying for this and what I do will now be focused on this. 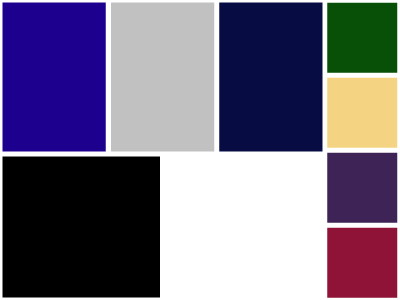 My main colors are: royal blue, gray, navy. My neturals are black and white. My accent colors are: green, cream, purple and berry pink. The colors for a capsule wardrobe are selected by filling in three categores: neutrals, main color, accents. 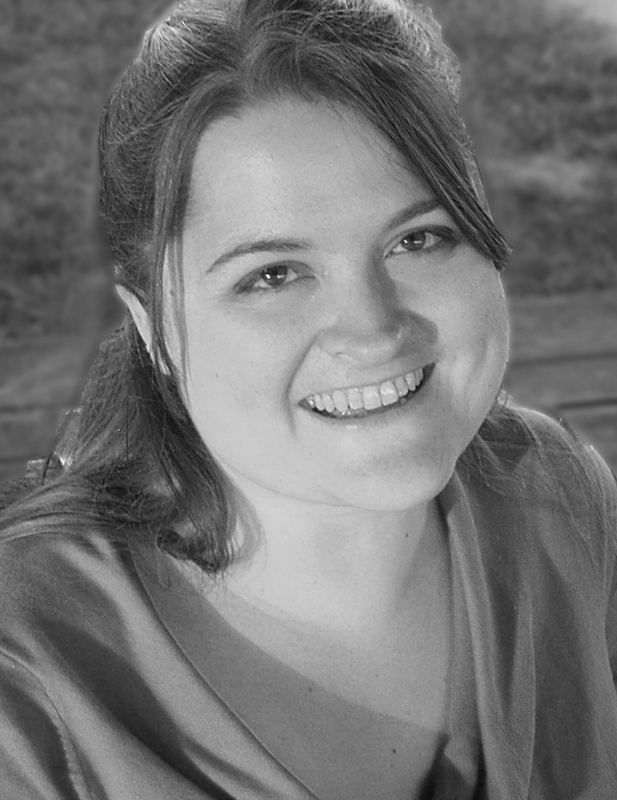 Anuschka Rees, author of The Curated Closet (which I haven't read yet, but have requested from the library), has an excellent description of this here, as well as list of example palettes here. 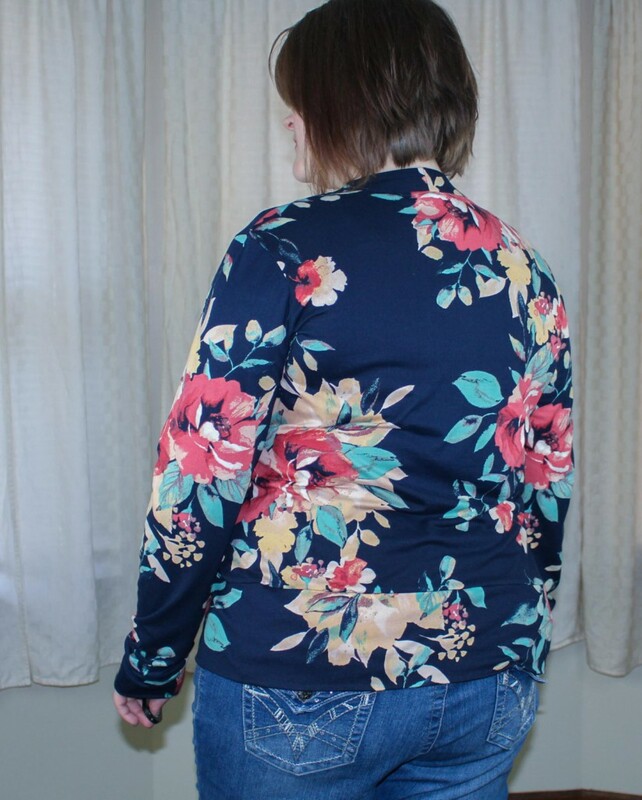 For discussions that are more focused on fabrics, you can find more info from the Curvy Sewing Collective, here, or from Colette's Wardrobe Architect series, here. The next step is to plan projects by pulling fabric and patterns. My favorite part! Posted in General on January 13, 2018 by ladyreed. 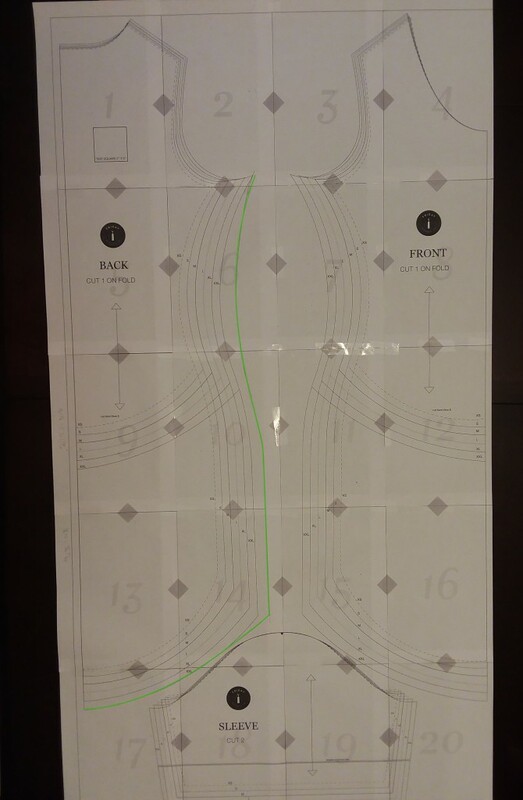 Sewing Plans: Next in line, please step up! In my last post, I talked about planning in 2 week chunks of time (usually called sprints, for us nerds). So this post is my plan for the next 2 weeks and what I'm going to sew. The Sunny Dress is up next. I've got it altered and ready for a wearable muslin. Because it's a knit dress, I could skip the muslin, but I have some concerns about the pattern and my alterations, so I'm going to do a muslin. I'll do more about all that in another post. Assuming that I get the Sunny dress to fit by next Monday or so, I'm going to start working on a hack for it. This is what I will actually submit for the #sewMyStyle2018. It's inspired by a Torrid dress, but I'm going to modify it so I can wear a bra with it. I doubt I'll have time to get it cut out even, but I want to at least have the pattern pieces ready to go. I want to identify items in my current wardrobe, me-made and RTW, that will work in the 3D capsule. If it doesn't, I'm going to give myself permission to donate it. I also want to start identifying gaps that my wardrobe has. This will be an ongoing process, but I'm going to commit to spend 1 hour on this. Because I'm starting a little late with this one, I'm going to be short a day or two, but I think I can still get this done by Jan 13. Let the fun begin! Posted in Planning on January 6, 2018 by ladyreed. Dreaming of the things I could sew! My goal this year is more intentionality in the sewing that I'm doing. I want to find more joy not only in the process, but in the finished results. I want to use my stash more and to buy fabric that will fit in and be used and loved quickly, not languish for long periods of time in boxes. This kind of focus only happens as the result of planning, so planning, here I come! I actually enjoy planning, and, if I"m honest, I might enjoy it more than the doing. I love getting organized and lining things up. It's the follow-through and the finish that sometimes get away from me. Knowing my weakness, I"m trying to plan this work in a way that is easy to see if I"m getting behind or if I need to change anything. A while back, I read a book called the 12 Week Year which is about getting results quickly and seeing change. There's a lot in the book in the process, but the gist of it is that deadlines should only be 2 weeks out and goals should only be 12 weeks out. The idea is to take what we do at the end of the year and do it every quarter. This way, we gain momentum by seeing goals accomplished quickly and are less likely to be derailed by unexpected things since we aren't planning things out as far. So, to that end, I am planning my 1Q goals and plans, only going out to March 31. The last week of March I will review where I'm at and redo the planning for 2Q. I'm excited to see if this will be a momentum-builder into April sewing for Me-Made-May. I'm going to assume my pace to be one garment every two weeks. I want to increase that next quarter to maybe 3 a month or more, but I'm trying to be realistic about my available time. 12 weeks divided into 2 week sprints (the term for short term goal deadlines) means I can sew 6 garments. Goals don't equal garments, though, so I will have more than 6 goals. It just means that every garment I sew has to fit into at least one of the goals I'm setting. Setting measurable goals only till March doesn't mean I can't think ahead or decide to do things further out than that. It just means that I'm going to commit to goals only until March and do a review then to see if I'm on track. I've also got some goals in mind for the whole year as well. Participate in Me-Made-May with at least 50% being me-made. Posted in Planning. Tags: 12 week year, 3D capsule, 3D capsule wardrobe, capsule wardrobe, dreams, goals, planning, plans, sewing planning on January 5, 2018 by ladyreed. I'm so excited to be participating in #SewMyStyle2018, hosted by Jessica Lorraine. 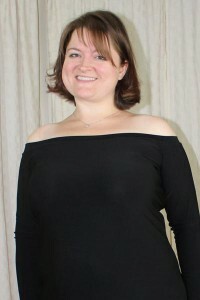 The January pattern is the Sunny Dress from Friday Pattern Co. I have finished taping the PDF and altering it for my size. If I were rating this pattern, so far I'd only be able to give it 2.5 or 3 out of 5. I'm not loving it. First of all, sizing. It seems inclusive as it goes up to XXL, but that XXL size is much smaller than what I would expect. To be fair, this is a knit pattern, and how much negative ease is in the pattern, if any, differs per designer. The description of this is "body skimming without being too tight," but based on my measurements and the garment measurement, that would not have been the case. It would have been tight enough on my to be more along the lines of lumpy sausage! Not what I feel beautiful in. Second, the sizing chart isn't included in the PDF instructions. I had to go back to the website to check for sizing. Not world ending, but kind of an oversight. There was also not a legend the showed the cutting line styles for each size. Again, not huge, but it's handy to have that. Taping went well. Marks were clear, and it all lined up nicely and was easy to cut and tape. I'll talk more about the alterations I made in a second, but after I had it all cut out, I noticed a drafting issue on the bottom of the back piece. Nothing huge at all, but the angle where the hem and back meet was incorrect. If sewed as drafted, there would be a point in the back. Minor, but, IMO, shows an oversight. Below, you can see the pencil line I've added to remove the point. The hem line need to be at 90 degrees from the fold line and them smooth into the hem line. There was a second mistake I noticed on the XXL size. The XXL line alternates a long dash line and shorter one. Halfway through the armhole, the line switches to the same dash as the XL line and continues in that dash through to the neck line. The line itself is correct, it simply uses the wrong dash pattern for a while. Not a huge thing, but I had a moment of , "Oh No!" when I was cutting because I thought I'd cut the wrong size out for a minute. For the alterations, I basically redrafted the sides. 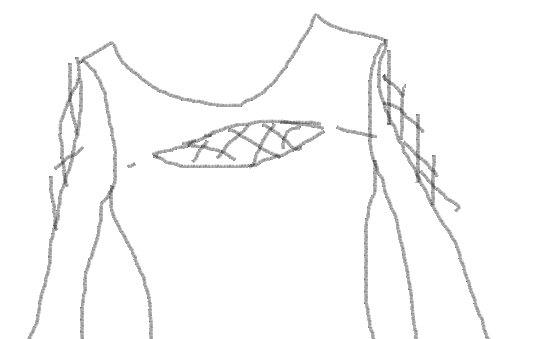 I kept to the XXL size along the armholes and neckline, but from the underarm point down, it's a new line. To find this line, I took my waist and hip measurements, divided them by four. Then, I measured from the fold line out toward the side seam and put a mark where that measurement fell. I did this on both the front and back piece and then measured the difference back to the XXL line. Adding the differences together, then dividing by two gave me the amount out from line to make my new line (the green line in the picture). For example: my waist is 40 and I wanted a little looseness in it, so I did 10 1/2" out from the fold line. Measuring from that back to the XXL line, the front was a difference of 3/4" and the back was 1 1/4". That makes the total difference 2", so, dividing that by 2 the amount I needed to increase both the front and back at the waist was 1". I repeated the process for my hips, which was much less (I'm apple shaped) at only 13/16" needed on both pieces. I made marks away from the line at those distances, on the back piece only, and then used a french curve to make a smooth line. After that, I simply flipped the back piece onto the front, keeping the underarm point matching and the fold line parallel. That allowed me trace the line from the back to the front. 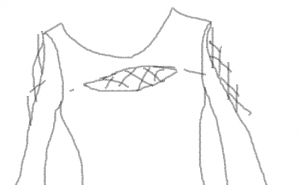 By keeping the underarm point the same, I didn't have to alter the sleeves at all. I probably needed more room in the bust, but not having to adjust the sleeves is worth a little tightness. At the hem, just a note, when widening the skirt, make sure to mark the new hem point straight out from the side. If you follow the hem up to the new side line it makes it shorter, and IMO, this dress doesn't need to be any shorter! The shoulder seams are a different angle than I'm used to seeing, so I'm thinking about doing a wearable muslin to start with, especially, as I've basically redrafted the sides. Posted in Sewing. Tags: alterations, dress sewing, fit, friday pattern company, new project, pattern adjustments, sewing, sunny dress, t-shirt dress on January 4, 2018 by ladyreed. My plan for this year's sewing is revolving around idea I had called 3D Capsules. Many of us are familiar with capsule wardrobes. Essentially, you limit yourself to a handful of interchangeable options that you know will always go with each other. It's color coordinated and laid out to easily make outfits that match your style and coordinate with each other. The limit of capsules wardrobes, however, is the number of items. Basically, it's too basic. There's not enough options. Even me, with my not-so-large wardrobe, I have more options to choose from than a basic capsule. While it's a very cool concept, I don't want to spend time sewing something that's boring, or disappears into my other clothes and isn't worth the planning and sewing effort. So, my solution? A 3D Capsule wardrobe. 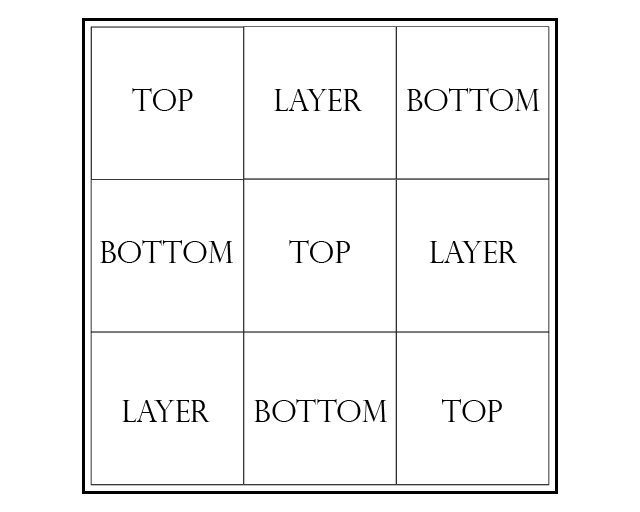 I was inspired by the Sudoku style capsule wardrobes where you have each box be an item and the items next to it build the wardrobe (for a more thorough explanation of this, read the CSC article, here). A 3D Capsule is different than a standard one because the idea is that each box isn't a specific item, but instead a specific style of item. For example, instead of having a pair of jeans be in the box, the box represents the style of jeans, and I can have several different jeans that fit in the spot. Another box could be fitted woven tops. In that box, I could put several different shirts, all of them fitted woven tops that fit the color scheme. I call it 3D because it's like it's file drawer and the drawer is labeled with what kind of item it is, but you can pull it out and find several different options behind it. Even with only a couple options in each style box, it would immensely increase the number of options that could be made by one capsule. As I was thinking about what I reach for in the morning, I realized that I do have a "uniform" of sorts. Nothing formal, of course, I work in a pretty casual office, but a uniform in the sense that I tend to most often wear items that are a similar style. For example, my office allows jeans, so I wear jeans every day. 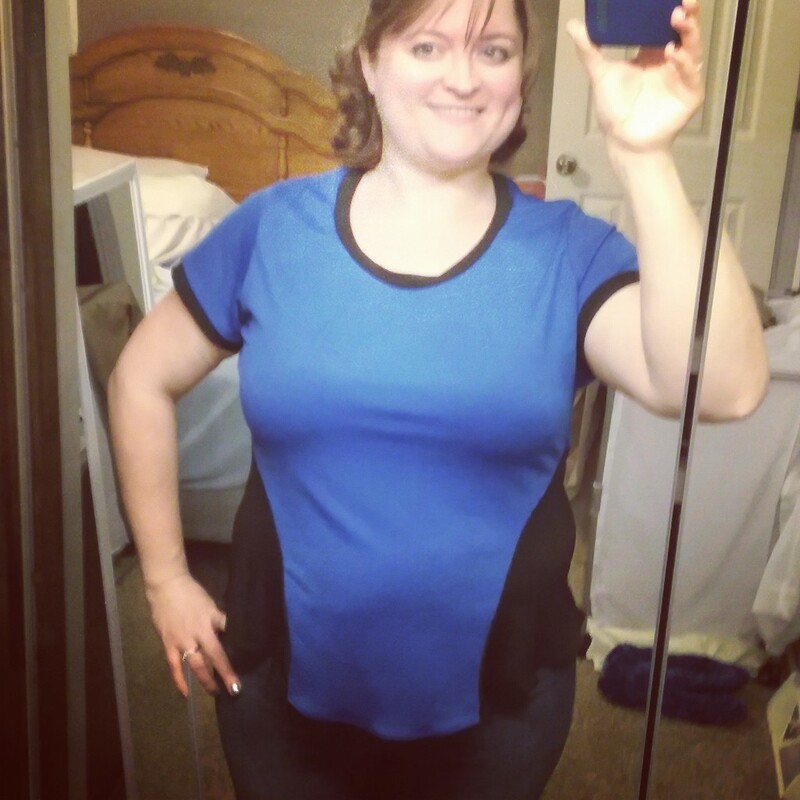 Then, I grab a top that is either a nicely fitting knit shirt (nothing baggy here! ), or a slightly more fitted, but still comfortable top. I don't wear boxy things, or loose things. I very rarely wear skirts, and never dresses. Since intention in my sewing and wardrobe is a focus for me this year, I wanted to start planning my sewing to include only items that fit my style and went together. Combining these ideas, I created my 3D Capsule idea. Below is my Every Day plan. It's what I am already most comfortable in and what I wear the most, style-wise. This grid gives me flexibility to include many different styles, but still gives a guideline for what I can and should be focusing on that will get worn and loved. 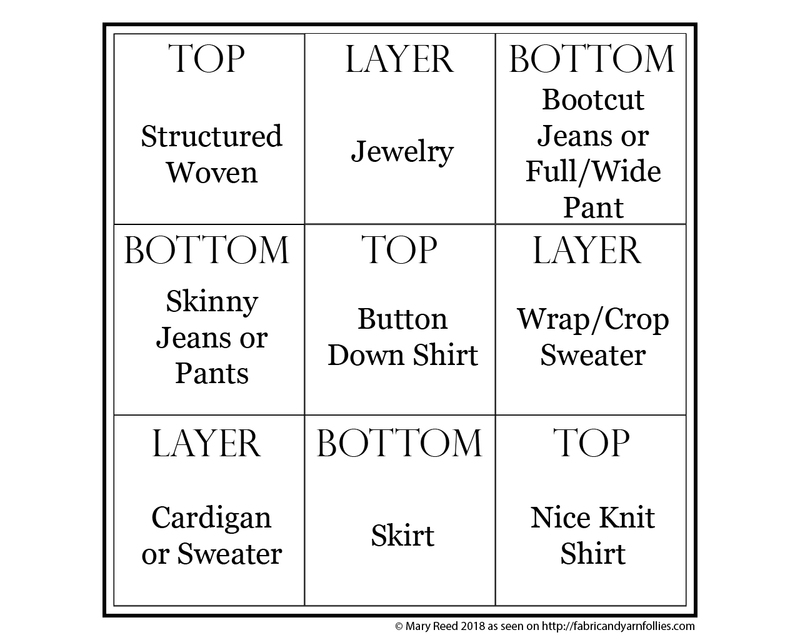 When I'm thinking about buying a new pattern, I can decide if it fits in one of these categories. Doesn't fit? Don't buy it. It means I can start developing TNT patterns and then variations on those patterns, so I can explore new techniques without feeling afraid of wasting the effort. It means I can quickly find the way to know if I'm expanding my wardrobe or cluttering it. In addition, I'll probably have a couple different 3D capsule wardrobe plans. In addition to this every day one, I'll make one that's slightly dressier, because on occasion I like to feel a little more put together. I'm considering adding a lounge one for night gowns/lounge clothes, etc., but that depends on how much sewing time I can find this year. My next step is to do an inventory of what I wear everyday that already fits in to the grid and what I want to start sewing on. Next up, I'm going to start working this plan into the 12 week year framework to see if I can get moment up this. Posted in General, Sewing. Tags: 3D Capulse, capsule wardrobe, new project, planning, sewing planning on January 3, 2018 by ladyreed.